Unknown assailants attack Chief Rabbi of Argentina and his wife at their home in Buenos Aires. 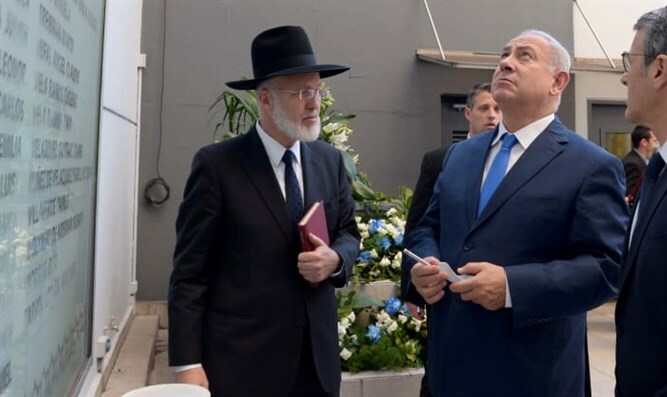 The Chief Rabbi of Argentina, Rabbi Gabriel Davidovich, was violently attacked Monday at his home in Buenos Aires, Yediot Aharonot reported, citing local media. According to the report, Rabbi Davidovich was attacked by unknown assailants who entered his home at around 2:00 a.m. and told him, "We know that you are the rabbi of the Jewish community." The assailants stole money and personal effects and attacked his wife as well. As a result of the attack, the rabbi was hospitalized in a local hospital and is in serious condition. The AMIA Jewish community center described the attack as “alarming” and called on local authorities to quickly investigate the assault. Channel 13 News reported that the attack on Rabbi Davidovich and his wife is the second anti-Semitic incident in Argentina in two days. On Sunday, gravestones were desecrated in a Jewish cemetery in the northern city of San Luis. The news coming from Argentina follows a string of anti-Semitic incidents in the United States and Europe. On Friday, swastikas and other anti-Semitic graffiti were drawn in a Jewish schoolyard in Queens. The words and drawings, found in the Rego Park Elementary School, have since been erased. Also on Friday, vandals suspected of being soccer hooligans from The Hague painted graffiti, including swastikas and anti-Semitic texts, on buildings in Amsterdam. France alone has seen a spate of anti-Semitic attacks in recent weeks, including the daubing of swastikas on nearly 100 graves in a Jewish cemetery in eastern France last Tuesday. A week earlier, a memorial in Paris to Ilan Halimi, a French-born Moroccan Jewish man who was murdered in 2006, was desecrated. In addition, swastikas and other anti-Semitic graffiti were found at multiple locations in Paris, including the window of a bagel shop and mailboxes which featured the portrait of French politician and Holocaust survivor Simone Veil.